Earlier, boxesport.com announced Buakaw Por Pramuk would be going to France to fight none other than recent competitor from Thailand’s Isuzu sponsored Thai Fight, Youssef Boughhahem. 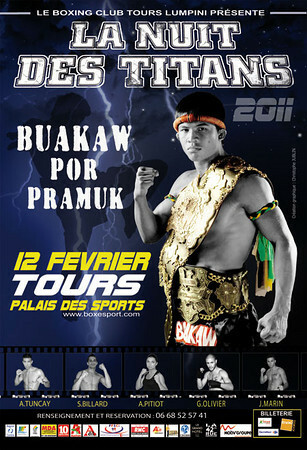 The event will be titled The Night of the Titans and will take place February 12th, 2011 at the Palais des Sports. Buakaw Por Pramuk came to international acclaim by becoming a 2-time champion of the Japanese Promotion K-1 MAX (middleweight kickboxing). Buakaw since then has not been active in K-1 MAX but has maintained a busy schedule fighting full rules Muay Thai internationally and also in the Japanese promotion Shootboxing where he has just become champion of the annual S-Cup tournament. Numeechai Scorpion Gym, Champion of Rajadamnern stadium: Tawalitnoi SKV Gym, ex champion of Lumpinee stadium and Thailand; YodNapa Changtalley, ex champion of Rajadamnern stadium, and Mangkornyok Sityodthong; champion of Pattaya who fights regularly broadcast on TV 9. Youssef also fought on the Isuzu sponsored Thai Fight where he made it into the final match against the eventual winner, Fabio Pinca. ~ by fatsoking on January 13, 2011.